Free Winx Musa coloring pages to print for kids. Download, print and color! In this part we collected Winx Musa coloring pages for girls. The character of the pictures is a fair-complexioned fairy with blue eyes and of Asian appearance. She loves music very much, create it, but it doesn't prevent her from taking care of her appearance. 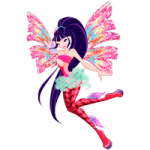 All the admirers of the popular animated series can print Winx Musa coloring pages and take part in her activities. Coloringtop.com - Free printable coloring pages for childrens and their parents, coloring sheets, coloring pictures, free coloring book. More than 20,000 coloring books to print and painting . Great choice for both girls and boys .